Graduation day is a memorable day for you and your family. It’s also a busy day for everyone involved. The McNichols Campus ceremony on May 11, 2019 will be two ceremonies. The morning ceremony will be for candidates who are receiving their master, specialist or doctorate degree. The afternoon ceremony will be for candidates who are receiving their bachelor degree. Plans and specific times for these events are in the planning stages and details will be available by January 2019. PLEASE STUDY THESE INSTRUCTIONS CAREFULLY AND KEEP THEM. Details are given to avoid practice sessions. Grad Images will photograph you three times: Once as you are walking forward to receive your diploma folder, once as you are shaking hands with the president and finally a still shot will be taken as you process down the far aisle to return to your seat. Graduates will receive full-color proofs and optional ordering information in the mail about a week after the ceremony. Graduation Images can be contacted at 800-424-3686, or you can visit their web site at www.gradimages.com. In an effort to inform parents and others about photos at the upcoming ceremony, there is a pre-registration system which allows you or your parents to provide email and mailing address information to Grad Images prior to the ceremony. You can add up to six family members' contact information to share the good news and the photos. You can pre-register friends and family email addresses and Grad Images will contact them just as soon as your photos are available for online viewing and ordering. To register, visit gradimages.com/register.cfm approximately 10 days before the ceremony when we have notified them of who is participating this year based on the RSVPs received by the deadline. Only those students who have sent in their RSVP card will be allowed to participate in the ceremony. Careful planning and seating is arranged for only those who have indicated in advance that they plan to be at the ceremony. Last-minute participants cannot be accommodated. Inside your cap there is a "front" designation. Wear your tassel on the right side of your cap. You will be instructed during the ceremony when to change it to the left. Check to see if your tassel matches the rest of your classmates receiving the same degree. If you are wearing a hood, please follow the package directions. Consult your faculty marshals with any questions. Individualized 3x5" color-coded index cards will be distributed to each candidate in your assembly room prior to the processional lineup. Typed on each card is the candidate's name, any honors and college or school section seat number. The number corresponds with your seat. The sequence follows the commencement program. Keep this card with you at all times and present to the Announcer. If the card is not presented to the announcer, your name will not be read. The announcers have been instructed to read only the college or school typed information. If your name is difficult to pronounce, write it phonetically on the card. Follow the specific instruction of your faculty marshals. Candidates will form double columns. Facing the direction of the procession, graduates with the odd numbered ID Cards will be in the left column, graduates with the even numbers the right column. If your partner is a no show, march alone. Over 30 minutes is needed to line up the participating candidates. Once the college and school processions are formed, the various components will move to Sacred Heart Square and march to Calihan Hall. It is tradition that a bagpiper leads the procession. The procession will arrive at Calihan Hall's northwest doors. Rain or shine, the procession will go on. If rain is predicted, bring an umbrella to use in the procession. It is also highly recommended that you wear comfortable shoes for walking. Each college or school will be led by its banner bearer who is followed by the faculty, graduate and undergraduate candidates respectively. In Calihan Hall, follow your marshal's instructions and proceed to your numbered seat and remain standing. Leave seats empty for absent candidates. College and school seating is arranged alphabetically by degree for candidates to walk forward to have their names announced. It also serves to help your guests, if they are following the program, to know when you will be awarded your degree as well as keeping order for the professional photographers. Once the platform party is in place, the ceremony will begin regardless of the time. Throughout the ceremony, listen to the grand marshal's instructions. The candidate seating plan will not be determined until graduation week. If your guests are interested in the general area where you will be sitting on the arena floor, have them review the seating diagram here or near the northeast entrance of Calihan Hall when they arrive for seating. 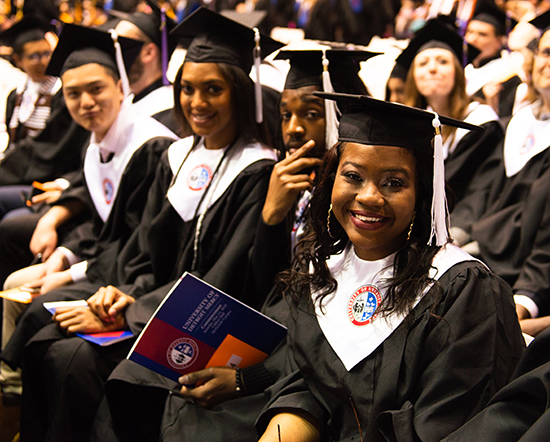 Commencement is a formal event that provides public recognition of your academic achievement. Commencement will last approximately an hour and a half for the graduate ceremony and two hours for the undergraduate ceremony. Participants are to remain in the hall for the duration of the program. Cellular/mobile phones should be turned off during the entire ceremony. Bottles, cups or cans will not be allowed in the processional or into the arena. Due to risk of injury, caps should not be thrown in the air. Photographs and videotapes will only be allowed from the upper seats. No floor photographs. Although celebration by graduates and guests is appropriate, air horns, balloons, screaming, banners, etc. are not. At the presentation of degrees, so that each graduate's name may be heard, please ask your guests to refrain from prolonged expressions of joy when your name is read. The ceremony in Calihan is expected to last about two hours. To add dignity to the event, all candidates and graduates are to remain in their position throughout the event. Restroom facilities are located in the hall to the left of the door you used to enter the arena. It is to be noted however, if you leave the arena prior to the end of the ceremony, a marshal will retain your diploma folder until you return to your position. For program details, review the Commencement Program which will be on your seat in Calihan Hall. This is the most important and solemn part of the ceremony. After the doctoral degrees have been conferred, the grand marshal will ask, in turn, the college and school candidates to rise. Stand in place. The dean will then recommend to the president that the degrees be conferred. The president will comply. After all of the degrees have been conferred, the grand marshal will then direct all of the graduates at once to change their tassels from the right to the left side of their caps. Follow marshals' directions. Each college or school graduate will move to the stage in single file in seat card number order to receive his or her degree folder. A photograph is taken as you walk forward in line towards the front of the arena. When you arrive at the front, present your ID card to the faculty gatekeeper who will present it to the announcer. When your name is read, proceed to the president. Receive your envelope with your left hand and shake hands with the president with your right hand. You will be photographed a second time at this point. Move down the line and shake hands with your dean. Proceed down the last aisle (third photograph is taken) to the rear of the arena and then back to your seat via the same aisle used in the processional. The recessional will be orderly and dignified. Follow the marshal's directions. The grand marshal will excuse the colleges and schools one by one. Graduates will recess out of Calihan Hall. Those receiving their diplomas will process to their respective college or schools to pick up their diplomas. Please make sure you have photo ID with you to pick up your diploma. To expedite campus egress after the commencement, all vehicles exiting the McNichols Gate will be required to make a right turn. Please advise your guests. The Baccalaureate Mass is celebrated in conjunction with Detroit Mercy graduation and is considered an integral part of the commencement activities. Candidates and guests of all faiths are invited to attend this Mass. It is a time to thank God for blessings received, and to pray for our future. Immediate family are invited and encouraged to attend. No tickets or reservations are required. The graduates are asked to assemble outside Gesu Church, in cap and gown. If you are interested in volunteering to take an active role in the ceremony – such as reading, being a eucharistic minister, or singing in the choir – please download an application form and return it to the University Ministry office. Go directly into the church, where you will be seated by the ushers. The procession begins at approximately 11:15 a.m., so be sure to arrive sometime before that. No photography is permitted during the Mass. You are encouraged to participate. Academic regalia is worn for this occasion. Faculty assemble outside the church. Employees are needed to serve as ushers, eucharistic ministers and singers. Please volunteer by contacting University Ministry. Any concerns or questions? Please call 313-993-1560, or stop by the ministry office, located in the Student Center across from the Bookstore.